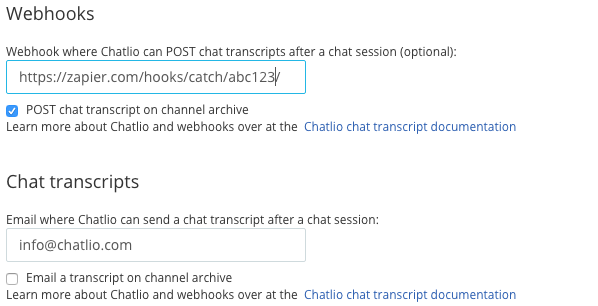 If you want to integrate your own systems more tightly with Chatlio, one option is to build a webhook and configure Chatlio to use it. If you want your chat transcripts to be imported into 3rd party systems (eg. Salesforce, Zendesk, etc), you can use a service like Zapier with the Chatlio webhook, or forward from your own webhook endpoint. When you have finished a conversation in Slack with a visitor to your site you can use the send-to-webhook Chatlio command to trigger a post over HTTP to your webhook. Chatlio will format the chat transcript along with some useful metadata as JSON. If you want this behavior to be automatic and always happen, check “POST chat transcript on channel archive” and/or “Email a transcript on channel archive” in the Chatlio dashboard. "replyToEmail": "[email protected]", // We use the visitor email here if we have it. "location": "Costa Mesa, California, United States"